This wonderful squiggly line is a climbing route. The route is called Policka and is located on the tower Hrad. A picture of this route I had already seen on the internet. When I was just wandering in between towers I found the line by accident. I could not wait to go climbing. And yes, what a great line! The route does not appear too difficult, except for a difficult and scary piece of "Offwidth" (see wide gap section after the route goes straight up). Your imagination runs wild when you see these towers in Adršpach. Behind this beautiful view is a hidden maze of big gray giants. Can you identify the king and the queen? When you are an early bird you will be the only one in this paradise. We went from one surprise to another. Every climbing route even more beautiful than the other. We took a route through the forest from Skaly. It's day one of our climbing trip in the Czech Republic. After half an hour we're suddenly faced with high gray walls leading to a narrow passage. A beautiful valley with endless trails. We are full of expectation of what awaits us! .... even more climbing routes! Everywhere ferns and trees are growing on terraces or simply out of crevices at different heights. Sometimes it makes me dizzy when I walk and keep looking around me. The sandstone forms continue to amaze us and is tarting to stimulate the imagination. What sound would this organ make? Michael climbing the last section of a wide splitter. Petr, who climbed it on lead, had to solo till the only bold at the point where Michael is. Classic climbing here is no nonsense. When you manage to control your nerves you can succeed, it is pure concentration. No room for doubt. Don´t bring your weak stuff up here. Michael climbs a route here without a belayer. There is just no possibility to secure it. So I have all the time to take a picture. Deze brede spleet heb ik zonder protectie moeten klimmen tot in het gat onder het dak. De eerste poging ben ik halverwege omgekeerd omdat ik serieus dacht dat ik ging vallen. De tweede keer was ik zeker van mijn zaak en klom ik direct zonder zekering door tot waar ik op de foto hang. 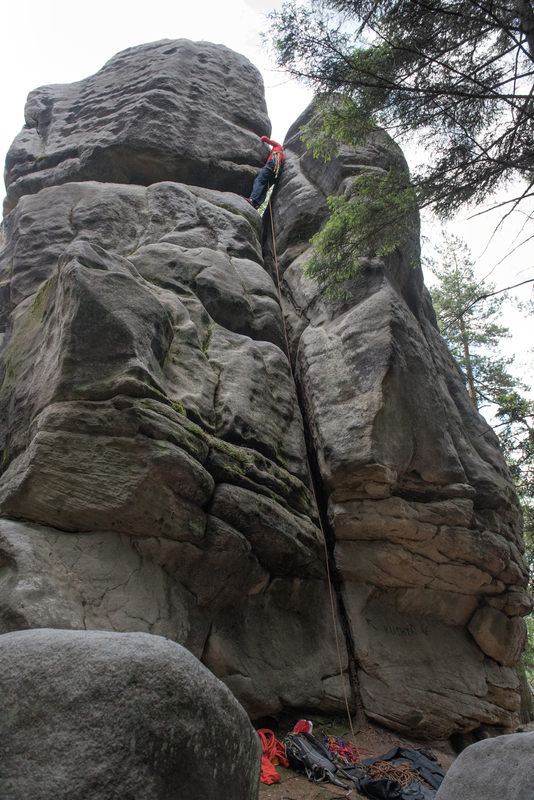 This was the reason I went to the Czech Republic, an monster Offwidth . A wall with one big splitter. A fantastic line, after 3 attempts I just did´t make it. The route is physically and mentally one of the toughest and longest Offwidth routes I encountered so far. It just delightful slacklining in the forest.above a soft carpet of grass.